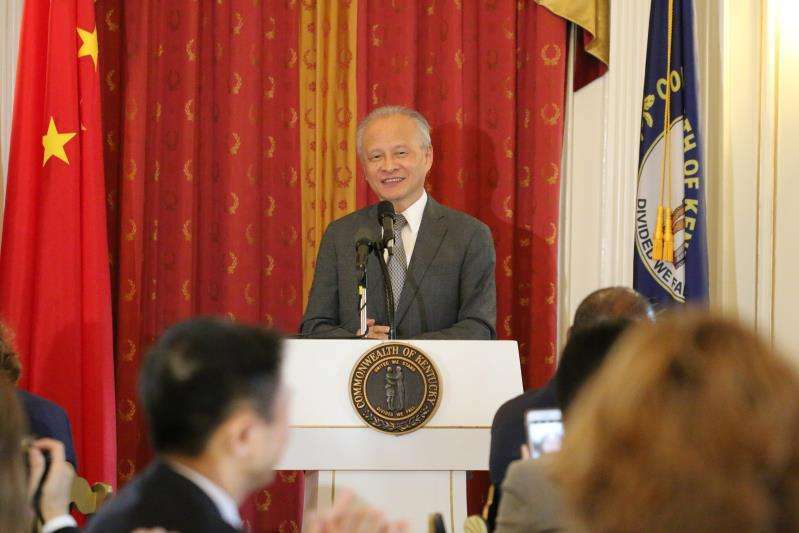 From 13 to 14 August, at the invitation of Governor Bevin, Ambassador Cui Tiankai visited the Commonwealth of Kentucky. During the visit, Ambassador Cui met with Governor Bevin and held a joint press conference, delivered remarks at the dinner hosted by the Governor, and exchanged views with the business community of Kentucky to discuss how to strengthen cooperation between China and the United States at both national and sub-national levels. Ambassador Cui was accompanied by Minister-Counselor Yin Chengwu and Counselor Xu Min of the Embassy. Ambassador Cui emphasized the importance of China-U.S. cooperation and sub-national exchanges. He believed that the very root and foundation of relations between China and the U.S. is in the localities and the people. The governments of the two countries and their respective provinces, states, cities and counties should work together to reduce all kinds of barriers, promote economic cooperation, strengthen cultural and people-to-people ties. 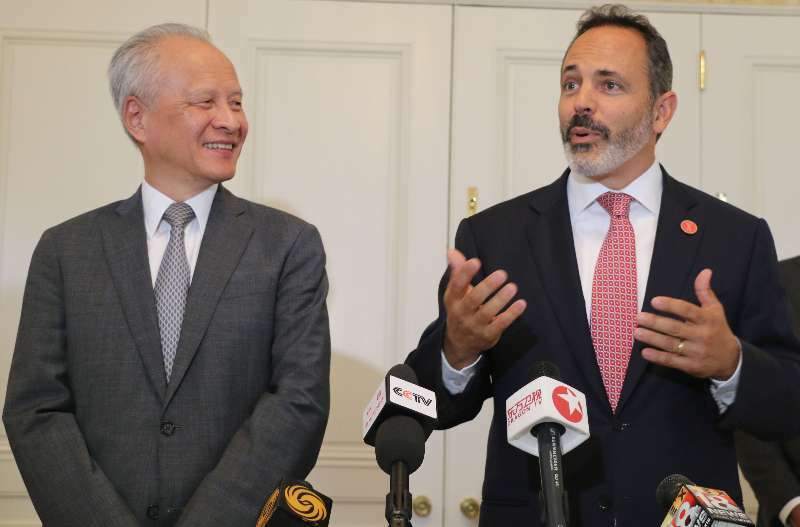 He expressed his hope that the Commonwealth of Kentucky could continue expanding trade and two-way investment and cultural links with China in order to benefit both peoples. Ambassador Cui welcomed Governor Bevin to visit China and attend the first China International Import Expo in November and offered assistance by the Chinese Embassy. Governor Bevin warmly welcomed Ambassador Cui to Kentucky and expressed his belief that the U.S. and China will both become better by forging a stronger partnership, and the two countries can solve the current economic frictions. He reaffirmed his commitment to promoting economic relations and trade between the U.S. and China through sub-national cooperation, and welcomed Chinese import from and investment in Kentucky. Local representatives from various sectors said that they attach great importance to exchanges and cooperation with China, and support the building of a friendly, mutually beneficial and win-win relationship between the U.S. and China. Kentucky boasts advanced industries of agriculture, tourism, manufacturing, aerospace, horse-racing, pharmaceuticals, etc. They expressed their hope to enhance cooperation with China in relevant areas, export more competitive products to China, and further expand trade, investment and people-to-people exchanges between Kentucky and China.